When Luke began his Junior year of high school, he decided to take a cooking course. He's a master sandwich maker, but even he conceded that even a grilled cheese sandwich wasn't really a "hot dinner." 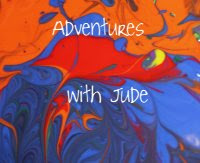 He became very proficient in the kitchen, trying old favorites and branching out to adapt new recipes. By now I can say, "I'm busy doing schoolwork with the others. There are pork chops in the fridge, do something with them," and an hour or so later, dinner is on the table. 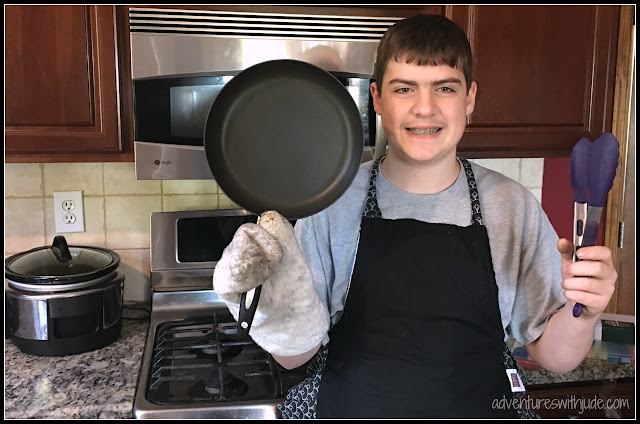 Matthew has watched Luke in the kitchen and has been itching for his turn, so when we received a MyFreezEasy.com Meal Plan Membership from MyFreezEasy, he suited up in the kitchen and was ready to cook. Easy there, cowboy! Let's find something to make first. 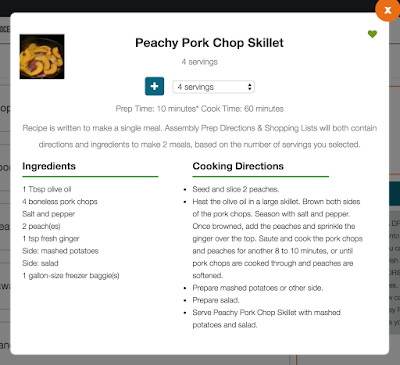 Each month, MyFreezEasy releases eight pre-organized meal plans that include recipes and shopping lists planned around a particular style of cooking or food, as well as a Build Your Own Meal Plan option. Having them organized by protein is a good idea for if you are thinking "Chicken is on sale this week," or "I have some ground beef to use up, but I'm not sure what I want to do with it." 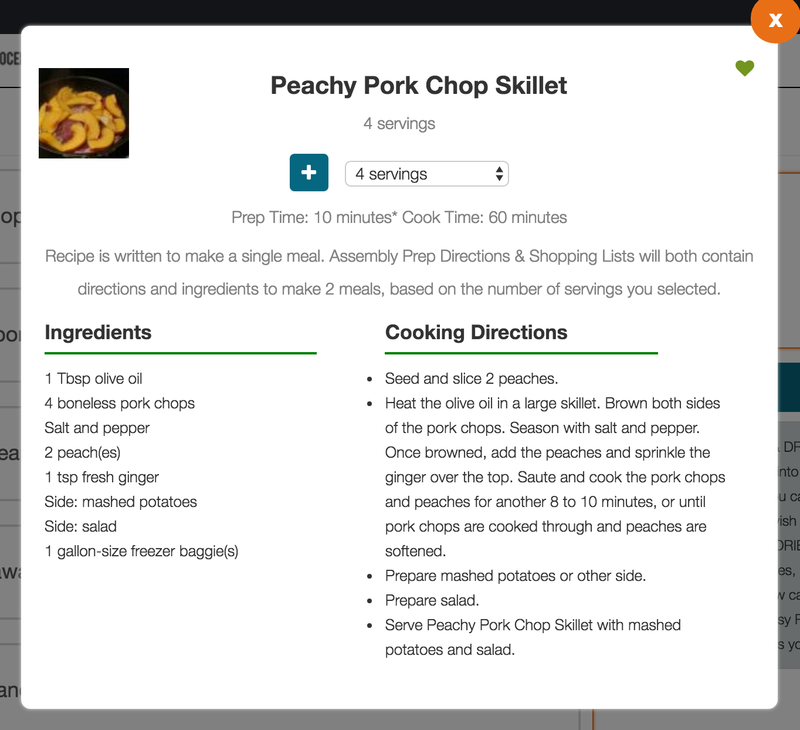 It's also nice that you're not flipping through skillet pork chop recipes when you know you want something for the slow cooker. 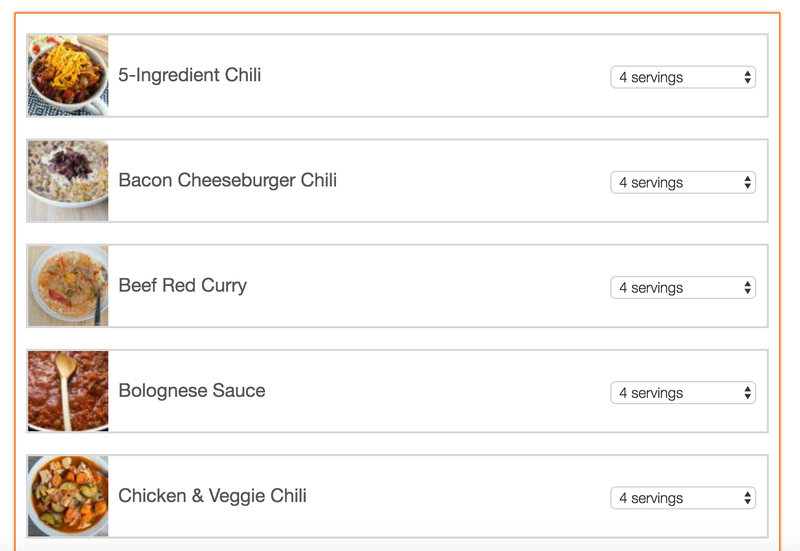 You can swap out another dish from same pre-made plan genre (ie, chicken, ground beef, etc.) if the pre-planned list has something that won't work for you. 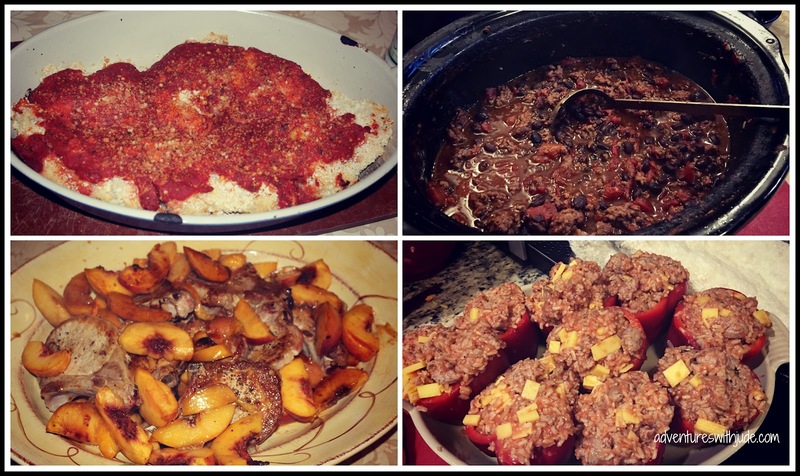 However, since I knew I wanted to try several different types of recipes before committing to a freezer full of them, we chose to mostly work within the BYO version. Among the things we made were Chicken Parmesan, Slow Cooker Beef and Black Bean Chili, Peachy Pork Chops, and Stuffed Peppers. One thing I appreciated is the recipe measurements are usually generous. We generally doubled the ingredients and still had leftovers! 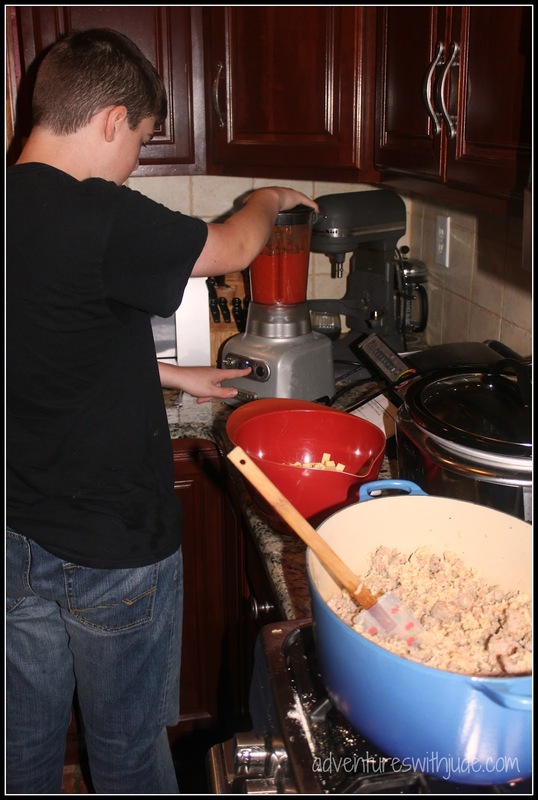 That's something that rarely happens with recipes served to teen boys! I appreciated having a night off in the kitchen when we ate them up! The one time we didn't have much left was when we made Chicken Asado -- my chicken pieces were on the smaller side and didn't go as far. I was skeptical when we first started this because we're not a "bulk cooking family." Even when I can tomatoes in the summer, I put them up plain, preferring to flavor them based on what we're eating when I open the jars rather than winding up having six jars of salsa and no pasta sauce! Much of our meat is bought in bulk -- every few months, we contract with a local butcher for a whole pig, a bulk order of chicken, etc. We receive it frozen, so it's pointless to defrost and re-freeze it just so it's in the "right" zip-top bag. I also was a little confused with why it would be worth the freezer space for some of the meal. One example is the chili we made. It certainly makes sense to brown the ground meat and freeze that, so it's ready to go, and I can certainly get on board with freezing prepared chili, but it didn't make sense to me to open cans into plastic bags. It's more storage-space-efficient for me just to open everything directly into the crock pot when I'm making dinner. For the pork chops, based on the freezer directions, it made more sense to me to take pork chops and already-frozen (and unless it's early July, generally less expensive that fresh) out of the freezer on the night I was ready to cook. 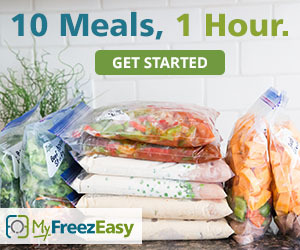 MyFreezEasy meals are very easy to prep. Directions are well written, so I can hand a beginner cook like Matthew a printout and say "go make this." There have been a few things he's needed help with, like learning how to pit peaches and the "wet hand/dry hand" technique for breading chicken. He would have been able to make the chili completely on his own, but apparently, the pop top on the first black bean can fought back. (We had to fall back and re-engage with a "use the can opener" strategy.) After seeing what Luke has made over the past two years, I know Matthew was a bit nervous that his meals would be as well received. 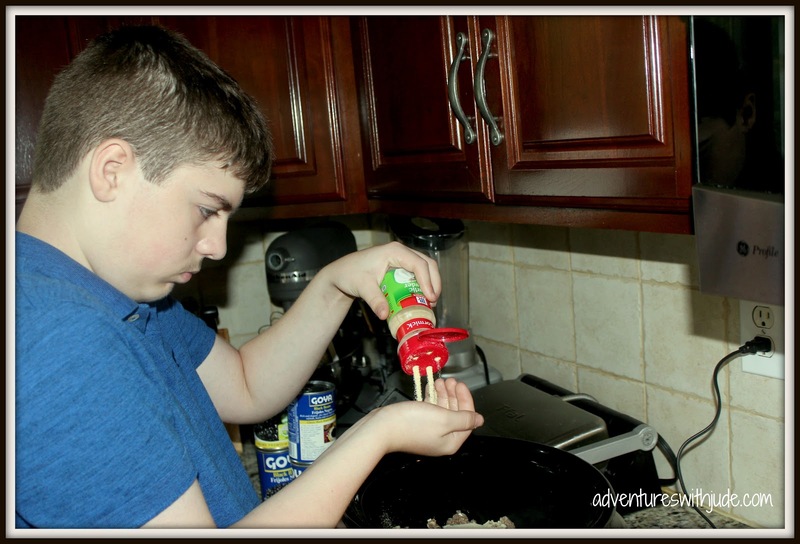 These were simple to make, helping him build his confidence in the kitchen. In almost every recipe, we adjusted the spice content -- my only real complaint is they recipes overall are very mild. We followed the pork chop recipe precisely, and found the flavor was good but little flat; next time we make it, we'll add a bit more ginger and maybe some allspice. I knew looking at the chili recipe that one teaspoon of garlic powder was not going to be enough for our family, so I stepped in and taught him how to pour ground spices into his hand to measure. He learned sometimes you DO need to measure carefully -- we were out of chili powder and had to make more, and in that scenario, measuring is necessary to keep the proportions even -- and other times, you can measure with the "eh...looks close enough" method. One thing I wasn't impressed with was the allergy flagging. 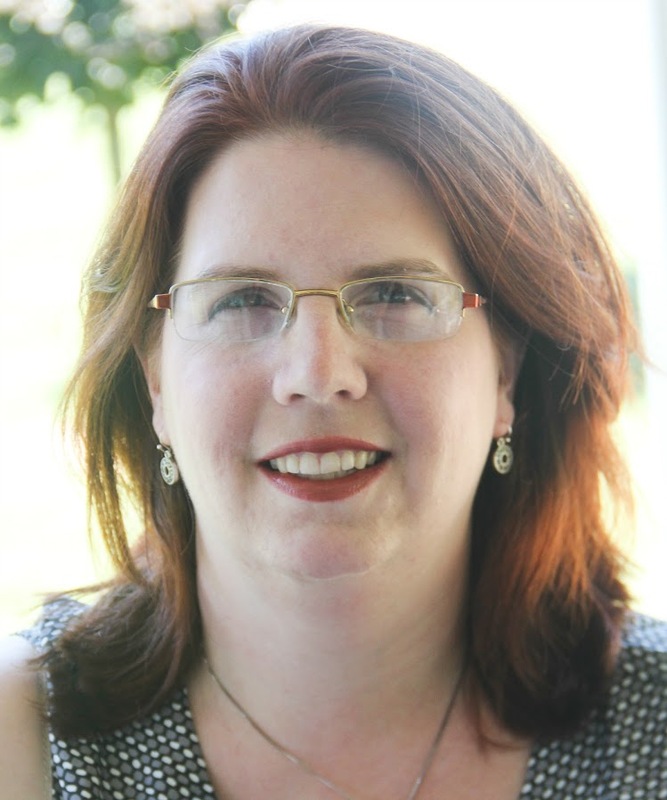 I admit, I am pretty biased on this one because I've been working around allergies for ten years now, and as I read recipes, I just swap ingredients in my mind. 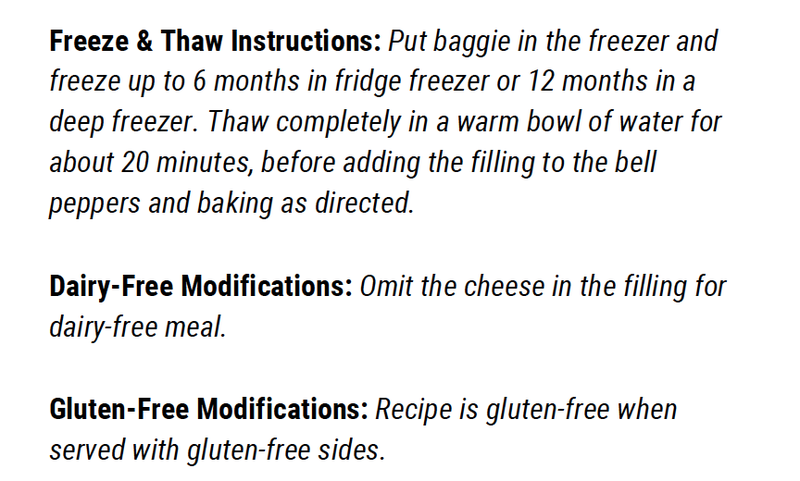 Many of the recipes were inherently free of the top 8 allergens, but sometimes recipes in the "gluten free" category were notes like "use gluten free bread crumbs," or "serve with gluten free sides." Several of the recipes were dairy based and said, "Unfortunately, there's not a good way to do this dairy free." This is from the stuffed pepper recipe. However, lasagna can easily be made dairy free using dairy-free cheese substitutes, and we made the peppers using a vegan cheese. Even the "parmesan cheese" topping on our chicken rendition was dairy free (you should have seen the happy dance I did in the grocery aisle when I found it -- this recipe gave me a reason to use it!) Yes, in some dishes it can be omitted, and I wouldn't expect her to know every brand, but I wish there was a little more effort put into the allergy offerings than just "choose gluten free sides" or "skip this item/recipe." There were several recipes that Matthew read at face value and was disappointed until I pointed out how we could work around them. We are enjoying our subscription to MyFreezEasy. 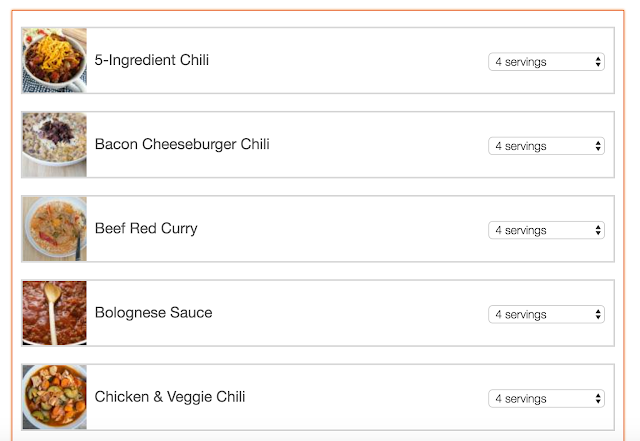 There is a good variation -- the menu lineups change each month, with some new recipes added and others retired, so there is something new to choose from as well as favorites. 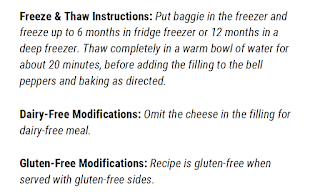 Because of how we grocery shop, I don't see us making many recipes to fill the freezer, but the "from the freezer" direcitons to the recipes will be a good guide for what Matthew needs to take out and defrost for his turns cooking dinner. For more about MyFreezEasy, follow them on social media or click the banner below to read others' reviews.